How small the world is getting! Yesterday on my, ahem, Music Critic blog, I was gossiping about Lukas Foss and Buffalo, and I mentioned a book about Glenn Gould I had reviewed by Katie Hafner. And there was a comment! Which is amazing in itself, but listen: the comment was from Ms. Hafner! She tells us a story about her dealings with Foss and his wife, Cornelia, that was not in her book! You can get in on all this excitement here. I started my, ahem, Music Critic blog because I think about music all the time and this was a place I could ramble on about that. Should anyone who reads the Leonard Pennario blog like to join me, the link to the, ahem, Music Critic blog is to the right of the screen, right under the picture of Pennario. Anyway, that was fun, hearing from Ms. Hafner. The Leonard Pennario biographer and the Glenn Gould biographer must meet! But where? That is the question. It would have to be halfway between Buffalo and Toronto because Pennario was from Buffalo and Gould was from Toronto. Maybe we could meet at the Ikea in Burlington. That is an idea. Once at that Ikea I bought a corkscrew named Groggy. Who could resist? 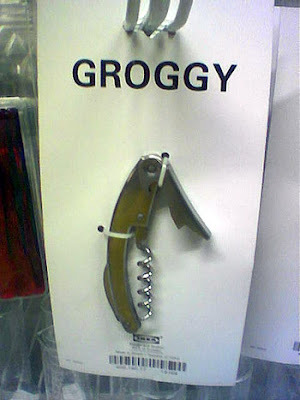 A Streetcar Named Desire has nothing on a Corkscrew named Groggy. That is Groggy pictured above. Another time I bought a quilt cover named Hokus. 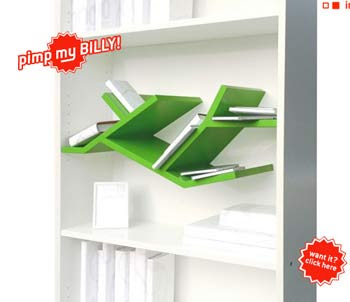 There is also a bookcase called Billy. Here is a picture of it that resembles what mine looked like when I was through assembling it. Oh, right, at Ikea, halfway between Buffalo and Toronto. Actually I do not think those two cities meet anywhere. We did a story once in The Buffalo News suggesting that they form one metropolis, called Buffaronto. But that will never happen! Toronto and Buffalo are as different as night and day, as Tops and Wegmans, as ... well, as Leonard Pennario and Glenn Gould! Once I went to "The Producers" in Toronto and I am being honest here: Everyone filed out of the theater in orderly fashion and in complete silence. Ha, ha! Not like at Shea's Buffalo, not by a long shot. In Toronto if you hold the door for someone the person does not say thank you and does not initiate a conversation about the weather, either. Pennario and I had that Buffalo thing going on and we used to laugh about Glenn Gould, the way Buffalonians laugh at Torontonians. Once when I mentioned Gould, I forget why, he told me this hilarious story about once when he was at a string quartet concert and Glenn Gould sat down next to him. It went on and on. I loved that story. It will be great for the book. Katie Hafner told a tremendous story about Gould in her book, "A Romance on Three Legs," which was about Gould and his search for a piano he liked. This Steinway technician -- his name was William Hupfer, so you picture this big German -- he patted Gould on the shoulder. Gould wigged out and wound up suing the company. What a nightmare! It's fun to read about -- I told the story more completely when I reviewed the book -- but ... what a freak! Pennario, in my experience anyway, was the complete opposite. Well, he was from Buffalo. If I had gone to California to get with Gould, I would really have needed my Groggy. I'll make you a deal. You don't have to read my blog on hockey statistics, "The Hockey Abstract," if I can mostly skip your blog on classical music. Unless, of course, you consider music by the Beatles and the Who as the classics. Billy bookcases are the best! I live in both Buffalo and Toronto and love each city for it's differences... but you can't really compare a small city like Buffalo to Toronto. In retrospect, I've never had anyone hold the door for me in Buffalo :( ... maybe they can tell I'm foreign, or worse, a Leaf fan.